When I arrive at the gate of Alepia, a small factory in the industrial zone of Santeny 30 km outside of Paris, there is little but a small sign to mark the entrance. No one who passes by would believe that inside, workers are busy preserving one of the most famous handicraft traditions from Aleppo, Syria– a soap tradition believed to date back some 3000 years. When I enter the factory, I am immediately hit with the overwhelming smell of laurel I recognize from the ancient souqs of the Middle East. Across the factory floor, thousands upon thousands of blocks of olive oil soap have been left out to dry. Throughout the Middle East, Aleppo is perhaps most famous for its diverse cuisine (there are peppers, pistachios and kebabs all named after the city), its ancient markets, and its soap. 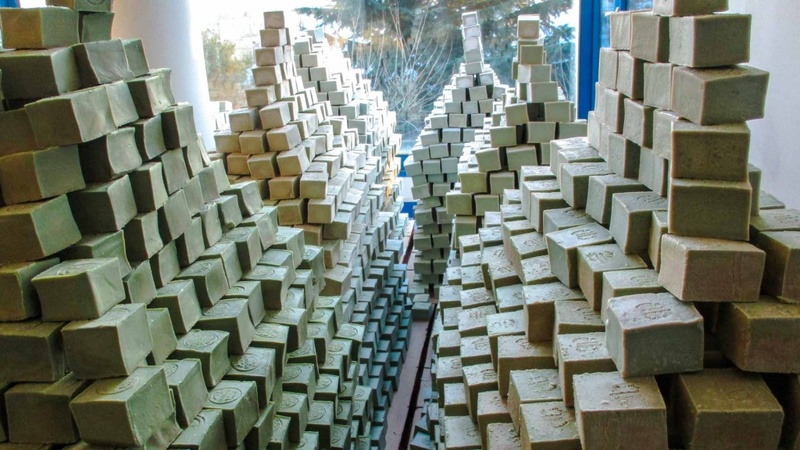 Though several Middle Eastern cities are known for olive oil soap, most notably Tripoli in Lebanon and Nablus in Palestine, Aleppo soap has always been the most prized. Before the war, at least 50 factories existed in Aleppo, making use of the excellent olive trees that grew around the city, as well as the laurel trees that historically have thrived in the nearby mountains of the south of Turkey. The soap was utilized in many of the city’s famous hammams, or public baths in the Old City, and carried by traders along the city’s trade routes to Europe as well as cities throughout the Middle East. In the past decade, I’ve seen Aleppo soap for sale in markets in Amman, Jordan as well as shops in the small village of Crest in France. In fact, Aleppo soap became so renowned in France that the famous La Maison de Savon de Marseille, known for their Marseille Soap, launched their own line of Aleppo soaps inspired by the city’s traditional method, recognizing Aleppo soap as the ancestor of the soap of Marseille. 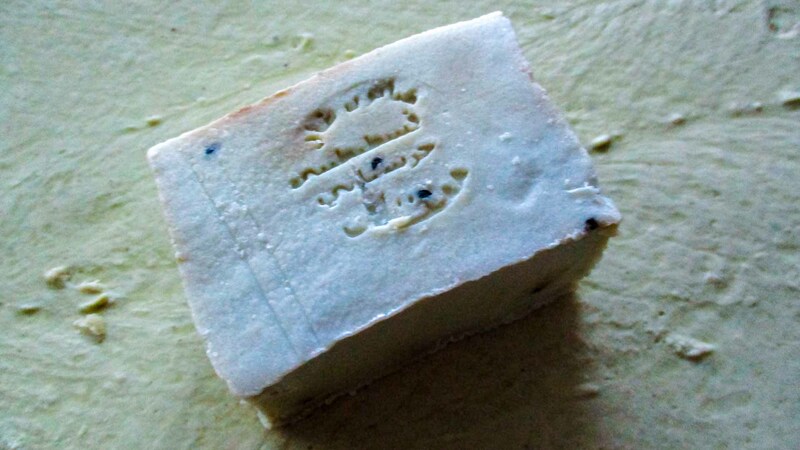 Composed of olive oil, which is a moisturizer, and laurel oil, which is a cleanser, as well as a small amount of lye, the famous green soap is cooked in vats before being left out to dry, hand cut into thick blocks and stamped with an Arabic seal marking the product as authentically Aleppan. The soap then must be aged several months before it can be used, a tradition that reminds me more of winemaking or cheese processing than the act of making a cleanser. 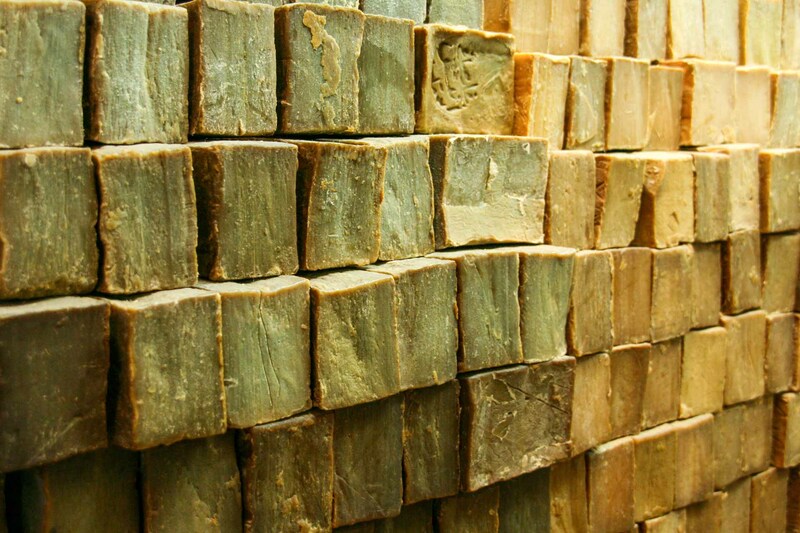 Aleppo soap is clear from its stages: the freshly made soap is bright green, and it is only when it darkens to a browner color that it is ready to use. But Aleppo’s soap was not always famous in France, and its revival can in part be thanked to Constantini, originally a doctor trained in toxicology, who was born in Syria but raised in France, and who had a crazy dream. Constantini’s first clear memory of Aleppo’s soap was when he was a seven-year old boy, visiting Syria and seeing his grandmother wash her hair with the soap. Though his family was from Damascus, like all Syrians they spoke of Aleppo soap with reverence. Syrians use olive oil soap not only for washing the body but also as shampoo, to clear cradle cap in infants and to treat skin problems. He forgot about the soap for many years and studied medicine in France, intent on becoming a doctor. Eventually he married a woman who also had her origins in Damascus. She went for a visit to Syria, and came back with Aleppo soap in her bag. That’s when he remembered his childhood, and spark went off. 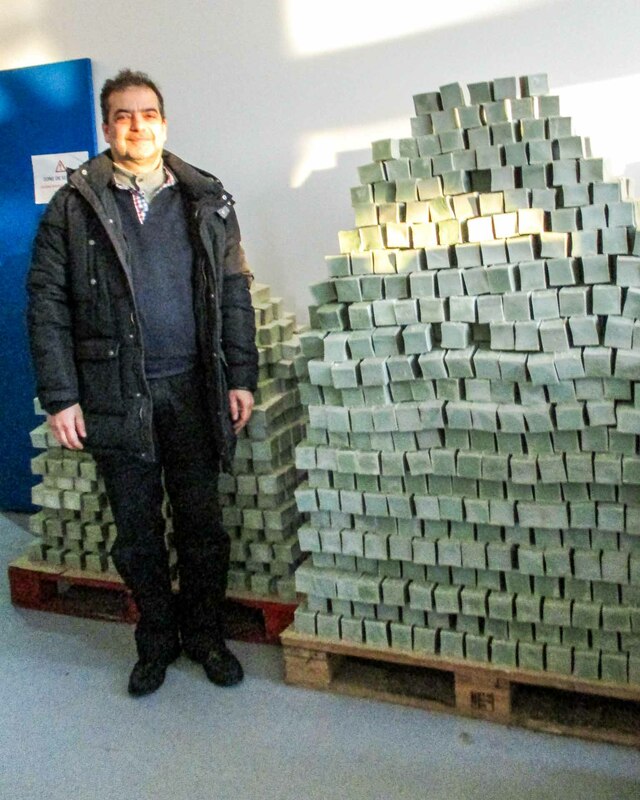 It took him two full years to sell his first stock of soap. Yet at the end, he felt that he was selling the soap more quickly. Skeptical buyers in the beginning kept coming back to buy more, and they were telling their family members. Encouraged, he returned to Aleppo and bought 15 tons. In 2008 Constantini returned to Aleppo once again, this time determined to track down the finest quality soap in the city. 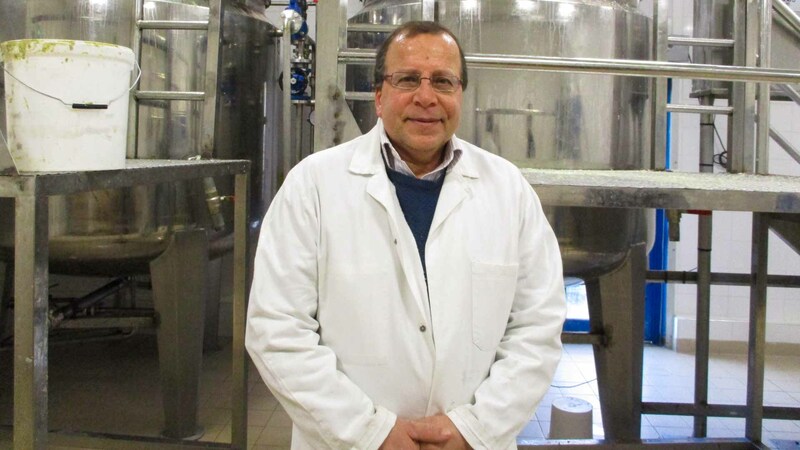 After making inquiries, his contacts kept leading him to master soapmaker Hassan Harastani, who had a factory in Aleppo and had learned the art of soapmaking from his father. 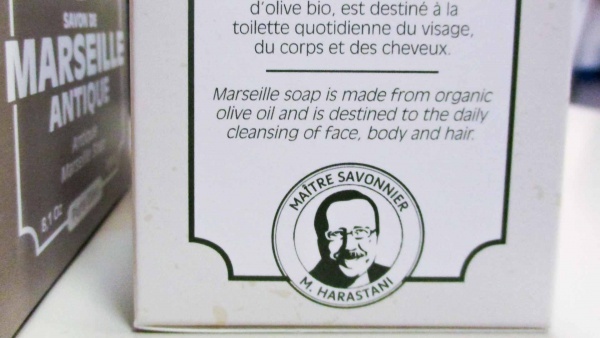 A partnership was born: Harastani made the soap in Aleppo, Constantini sold the soap in France. The popularity increased, and Constantini began plans to build a factory of his own in Aleppo where they would produce soap for the French market. Yet when the war broke out, everything changed. Aleppo became the heart of the country’s civil war, and it soon became impossible to import soap. In the meantime, demand in France was surging. Constantani sold 100 tons of Aleppo soap, as his buyers panicked that they would not be able to buy it again after the war. Then Harastani’s factory was destroyed: soon after, his house was attacked and looted. He, his wife and daughter fled to Lebanon, having lost everything. It was a double crisis. Harastani could no longer make soap, and Constantini had his supply dry up. Finally, Constantini tracked Harastani down in Lebanon, and he urged him to come to France. Yet Harastani, renowned as an expert in Aleppo, who had also pursued a Masters at the American University in Beirut, bristled at the idea of coming to France as a refugee. He insisted, though it would take time, that they fill out the paperwork and acquire the permits that would allow him to move to France as a master soapmaker. In France, where master craftsmen are still treated with great respect, such distinctions mattered. It took 10 months. But finally, Harastani arrived in France with his family, his expertise formally recognized. The pair are busy strategizing on how they can make their soap as authentic as possible without access to products from Syria. They’ve taken to using olive oil from Morocco, as its qualities most closely resemble the olive oil produced in the bright sun around Aleppo. They still import laurel from the mountains in the south of Turkey: the very same laurel used in Aleppo soap. 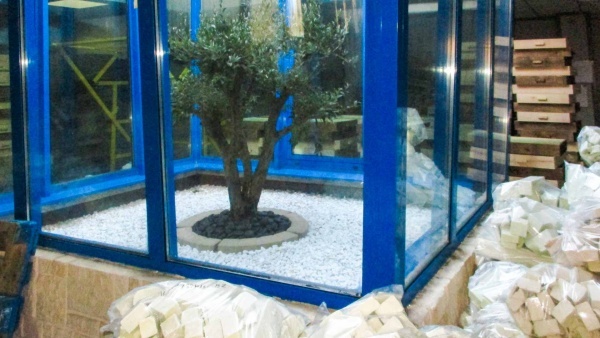 They’ve even begun using fully organic olive oil for some of their soap to minimize the chemical agents even more, and have doubled the amount of laurel to 25% in some of their soaps to create a higher quality product. In the end, it is a remarkable story of two very determined men who are saving heritage against all odds. At the center of their factory, they have built an atrium where a single olive tree is planted, surrounded by glass windows, the roof open to the sky. It is a reminder of home, the Middle Eastern symbol of blessedness. These days, the newest soaps are easy to recognize. Each bar of soap itself is still hand cut and stamped, but is then placed in beautiful boxes more palatable to a French audience. And on the box is a picture of Hassan Harastani, and the stamp: Master soapmaker.